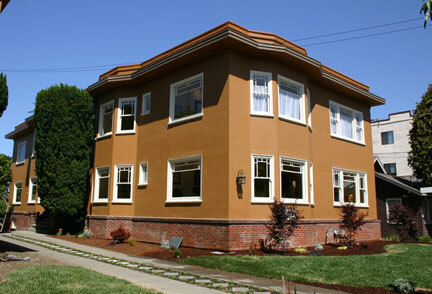 This two-story fourplex and a twin structure were built on the former courts of the Berkeley Tennis Club after the latter had moved next to the Claremont Hotel. In August 2006, a three-alarm fire caused extensive damage to both floors of this building. It was purchased in 2007 and restored the following year, preserving the integrity of the original building. The four apartments were converted into 2-bedroom, 2-bath condominiums that retain the original fireplaces and handsome windows. 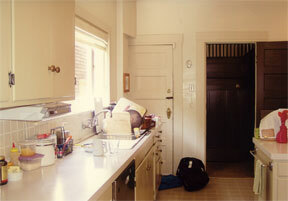 Damaged hardwood floors were replaced with kind, and new fixtures are consistent in style with the buildings period. The developer worked with the neighbors in the twin building to come up with an exterior color scheme for both buildings, so they maintain their unified appearance. Even the mature cypress trees standing guard over both entrances were preserved. 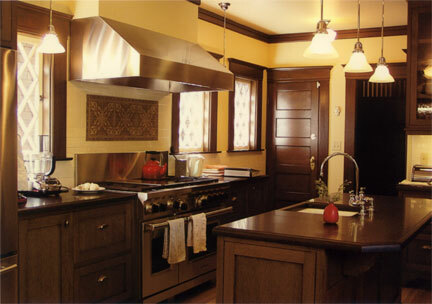 What appears to be a simple kitchen remodel was actually a complex design project, addressing existing circulation and historic features within an older house, as well as the home’s small corner lot, which left the kitchen in close proximity to property lines, with very few outside views. As a remedy, the kitchen was completely reoriented, and and all existing inerior walls in this quadrant of the house were removed. 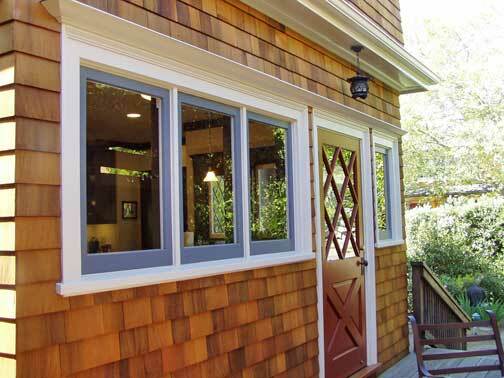 Since many windows were added, steel moment frames were required to satisfy lateral loads. The frames in turn required new foundation work. The frames were skillfully hidden inside the original walls. Then floor joists were discovered, bearing on the unreinforced historic clinker-brick skirt base. The bricks had to be removed and reinstalled over a new foundation. 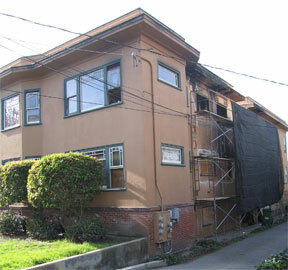 Shear walls were built, stucco and shingles were replaced, and exterior plumbing was rerouted. The end result is a kitchen that looks as if it were built at the turn of the 20th century but will last well into the 21st. 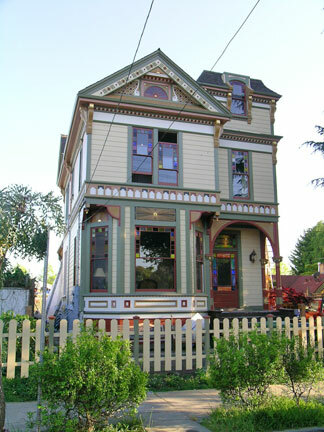 This elegant Queen Anne house was originally built on a corner lot at 1901 University Avenue and Grove Street (now MLK Jr. Way). 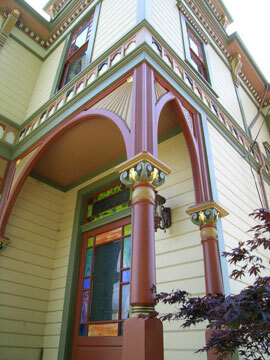 The first owner was George Pape, proprietor of the East Berkeley Planing Mill, which explains the abundant ornamentation on the house. 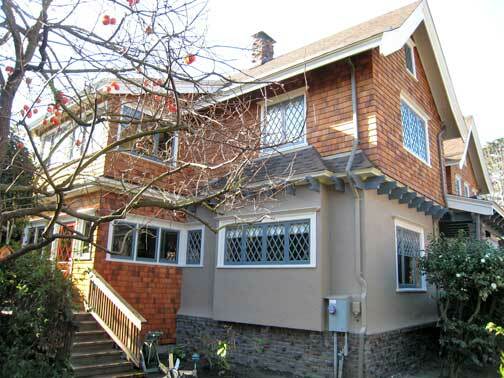 Pape did not live in this house, and within a year he had sold it to the Puget Sound Lumber Company. By 1907, the property had passed into the hands of Fred T. Williamson, manager of the Berkeley Ice Company. 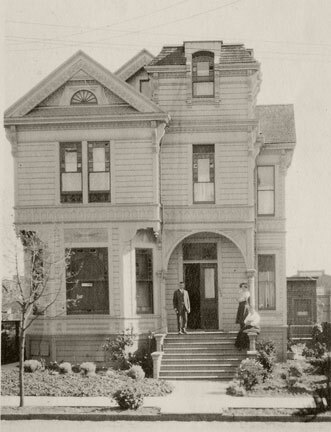 About 1911, Williamson decided to build a store on the site, and the house was acquired by Barzilla P. Bull, Alameda County deputy sheriff, who moved it a block to the north, to its present location. For many decades beginning in the 1920s, the house was home of the Kaler family. By the time it was acquired by its present owner, the house was badly in need of restoration. Enter a specialist in Victorian painting and restoration, who lavished attention on every detail. 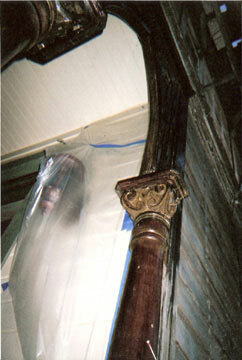 Old wood was repaired, rejuvenated, and painted a ravishing rainbow of seven colors. Details that were past revival were replaced with exact replicas. 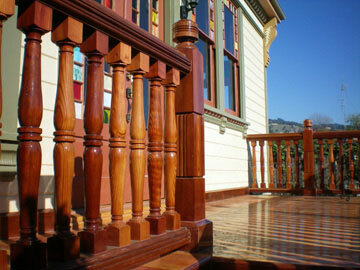 A new rear deck was meticulously built with a turned railing that is period-correct. BAHA salutes this brilliant labor of love. The Cagliostro House is an exceptional example of modern architecture. Breaking with tradition involves risksometimes asking materials and design details to do too much. Some of the very features that contribute to the visual drama and uncompromising clarity of Hillmers design were also contributing to the buildings failure to protect itself and its occupants from water intrusion and damage. 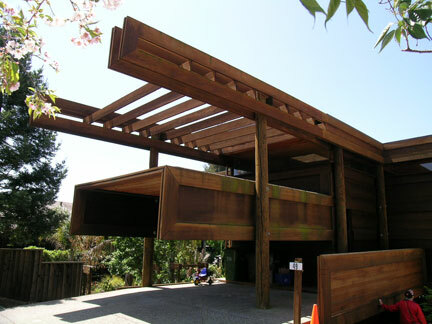 The redwood plywood used throughout the building as both interior and exterior siding proved to have little decay resistance. By the time this house was rebuilt in the early 1990s, redwood plywood was no longer being laminated from redwood but consisted of Douglas fir plywood covered on one side by a thin redwood veneer. There was extensive decay of the plywood concealed behind many of the heavy redwood trim boards, while the plywood exposed to the weather appeared to be sound. The market no longer offered a viable replacement product for the damaged plywood siding that had been removed. The novel construction sequence used here meant that it would be nearly impossible to remove most of the siding, because it had been installed against the massive exoskeleton of poles and horizontal 2-by-12s. 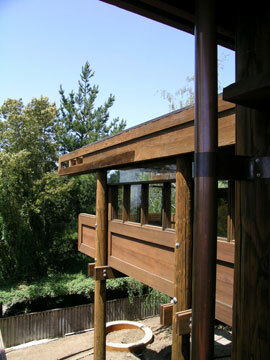 After ascertaining that each section of the exterior is sound enough to leave in place, the plywood is clad with solid redwood shiplap siding over a layer of building paper, allowing the inclusion of a conventional copper flashing detail to direct any water to the outside of the assembly. In the deck railings and other assemblies outside ofthe building envelope, the original plywood is being replaced with pressure-treated plywood covered by the new shiplap siding. 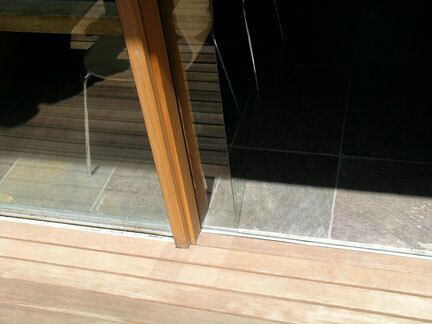 In this work-in-progress, the kitchen deck and the entry deck and railing have been rebuilt. New rain collectors and leader pipes carry the water into buried drain lines. 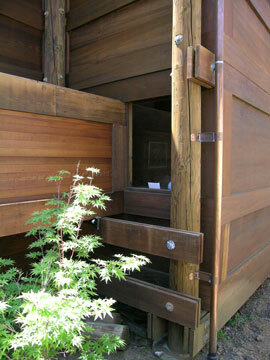 The siding necessary to clad the remaining exterior plywood has been custom-milled and awaits installation. This exemplary work stands as encouragement to anyone facing a similarly daunting challenge. Copyright © 2009–2019 BAHA. All rights reserved.